Well, maybe not quite Scherben, but close. It felt a little Swedish Chef-ish to make this week’s Tuesdays with Dorie recipe, since it was something a little crazy and unusual. A little ball of dough made from a small amount of butter, a tiny bit of sugar, a pinch of salt, one egg and a little flour and baking powder is then rolled out and cut into funky shapes and then deep fried. 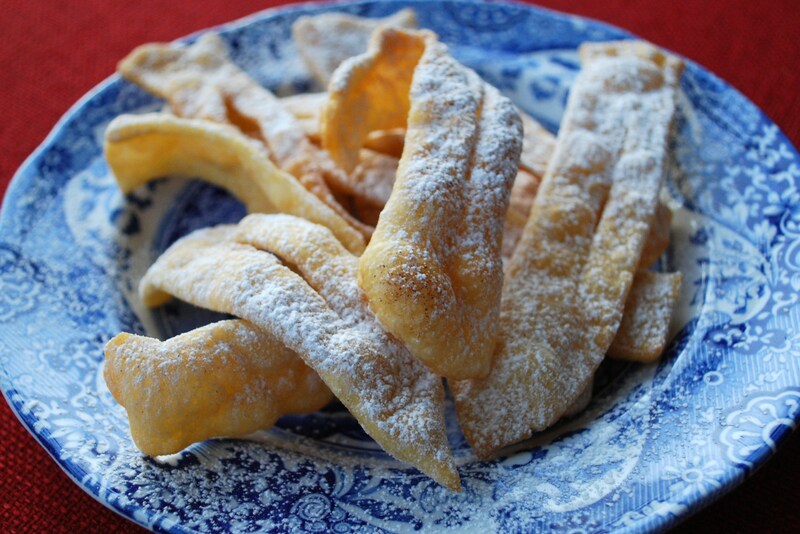 The fried ‘shards’ are then covered in cinnamon sugar and powdered sugar to make a crispy and sweet and slightly addictive snack. I wasn’t sure about them at first, but they grew on me and I found myself picking the last little pieces out of the sugar from the bottom of the bag. Teanna of Spork or Foon? was the host this week, and you can find recipe there if you want to try these. Hmmm, what can I fry next . . . maybe doughnuts?